Meet Larry Clark, a tenacious survivor who has battled nine recurrences of pancreatic cancer since being diagnosed in 2013. What’s his secret to beating his aggressive Stage IV disease? A “dream team” of doctors, multiple clinical trials and an undeniable fighting spirit. As a nearly four-year pancreatic cancer survivor who has battled nine recurrences of the disease, retired Mayor Larry Clark is a beacon of hope to others facing the disease. His approach to managing an aggressive stage IV disease is to stay informed about available treatment options. He even has Google Alerts set to tell him about treatment advances and other research findings to help him be as proactive and knowledgeable as possible. Clinical trials are an important part of his strategy. “I can’t stress enough how important it is to consider clinical trials as part of pancreatic cancer treatment. It’s one major reason why I’m alive and doing well today, along with excellent care from Dr. Nicholas Nissen and my ‘Dream Team’ of specialists.” Larry has participated in two trials. He believes one trial strengthened his immune system and kept his cancer from recurring for one year. Larry strongly advocates for everyone diagnosed with pancreatic cancer to explore available trials through our online Clinical Trial Finder tool. Patient Central Associates are also available to run personalized clinical trial searches. Learn more about clinical trials today. We’re here to help. Contact a Patient Central Associate for in-depth details about clinical trials and to get your questions answered. Associates are available Monday Friday, 7 a.m. to 5 p.m. Pacific Time. Larry advocates that “All of us must join the fight to fund critically needed research that is vital … to make pancreatic cancer a manageable disease.” This is why he serves as Honorary Co-Chair and fundraises for PurpleStride Los Angeles. From the moment that 29-year-old Xan Harwood-Karlik was diagnosed with pancreatic cancer, he knew he needed to be his own health advocate. Learn more about Xan, personalized medicine and the art of staying active during pancreatic cancer treatment. In November 2014, 29-year-old Xan Harwood-Karlik of Portland, Ore., was diagnosed with stage 3 pancreatic cancer. He immediately started a rigorous treatment program involving aggressive chemotherapy, immunotherapy clinical trials, radiation, major surgery and then more chemotherapy. Initial results were extremely promising, but a year after diagnosis, his healthcare team confirmed a recurrence of the disease in his liver, reclassifying the diagnosis to stage 4. Xan and his wife, Sara, had their first child last October. He is thankful that his treatment is grateful to have been able to meet his son. For more information about Know Your Tumor, contact Patient Central. This two-time cancer survivor has one goal: to make purple the new pink. Read more about Cathy’s battles with breast cancer and pancreatic cancer, and her determination to bring the nation’s deadliest major cancer out of the shadows. Beating cancer is no easy feat. For Cathy Schwandt of Columbus, Ohio, that is especially true. She is a two-time cancer survivor: first breast cancer and then, many years later, pancreatic cancer. She knows very well the importance of never giving up. She’s also made it her mission, through her volunteer work, to help fellow survivors continue to keep fighting back. She was diagnosed with breast cancer in 1980 at only 28 years old. Not a lot was known about the disease back then. But when Cathy was diagnosed with pancreatic cancer in 2013, her outlook on cancer changed. But she said the diagnosis also drove home the importance of doing what she could to create awareness because pancreatic cancer is still in the shadows, like breast cancer once was, but it doesn’t have to be that way. 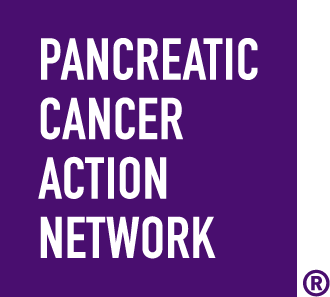 Cathy got involved with the Pancreatic Cancer Action Network as a volunteer with the Columbus, OH Affiliate. After meeting fellow survivors who had faced the same fears she had, she wanted to do more to help others in a similar situation. She soon became the Community Engagement Chair, a volunteer leadership role that works closely with local pancreatic cancer survivors and their families. She is also a member of our newly founded Survivor Council, which ensures the survivors’ voice, experience and expertise are integrated into the Pancreatic Cancer Action Network’s programs and initiatives. Cathy was a speaker at PurpleStride Columbus in 2014. She relayed to the crowd her experience as a pancreatic cancer survivor, but also drew upon her experience as a breast cancer survivor.